Florence Li Tim-Oi was born on 5 May 1907 and was to become the first woman ordained an Anglican priest. Li Tim-Oi, whose name means “much beloved daughter,” was born in Hong Kong. She graduated from Union Theological College in Guangzhou in 1938, was a lay minister in Kowloon and later in Macao, and was ordained as deaconess in May 1941. Later that year, Hong Kong fell to the Japanese and priests could no longer travel to Macao to celebrate the Eucharist. As Tim-Oi continued her ministry, Bishop Ronald Hall of Hong Kong decided that “God’s work would reap better results if she had the proper title” of priest. He ordained her on January 25, 1944. Her ordination caused much controversy after the end of World War II and Tim-Oi decided not to continue exercising her priesthood until it was acknowledged by the wider Anglican Communion. Hall had appointed her rector of St. Barnabas Church in Hepu and said she was still to be called a priest. The 1948 Lambeth Conference refused to recognize her ordination, as did two successive Archbishops of Canterbury. The Conference rejected a request brought to it by what was known as the then General Synod of the Church in China to experiment with ordaining deaconesses to the priesthood. “The Conference feels bound to reply that in its opinion such an experiment would be against the tradition and order and would gravely affect the internal and external relations of the Anglican Communion” Lambeth said. The Conference reaffirmed a decision made in 1930, saying that women were only qualified to be deaconesses. When Communism came to power in 1949, Tim-Oi studied theology in Beijing to understand the implications of the Three-Self Movement which had been instituted to govern church life in China. She moved to Guangzhou to teach and serve at the Cathedral of Our Savior. When the government closed all the churches in China between 1958 and 1974, Tim-Oi was forced to work on a farm and then in a factory, and was required to undergo political ‘re-education’ and contemplated suicide. She was allowed to retire from factory work in 1974 and went to the mountains to pray during the years when she did not dare be seen with her Christian friends. She was forced by the Chinese Red Guard to cut up her vestments with scissors. Tim-Oi was able to resume her public ministry in 1979 and, two years later, she was allowed to visit family in Canada. While there, she was licensed as a priest in the Diocese of Montreal and later in the Diocese of Toronto. She eventually settled in Toronto and received doctorates of divinity at New York’s General Theological Seminary in 1987 and at Toronto’s Trinity College in 1991. 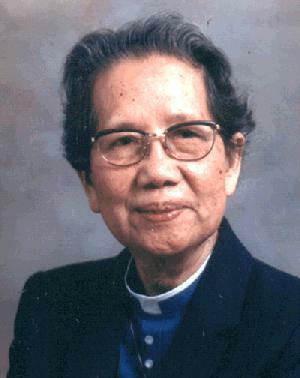 The Revd Florence Li Tim-Oi died in Toronto on 26 February 1992. The Episcopal Church’s General Convention agreed in June 2006 to commemorate Tim-Oi’s ordination annually on 24 January (Tim-Oi’s actual ordination date is the Feast of the Conversion of St. Peter the Apostle). The Li Tim-Oi Foundation has helped 200 women from 67 dioceses in 11 provinces of the Anglican Communion train for ministry, including more than 50 for ordination.